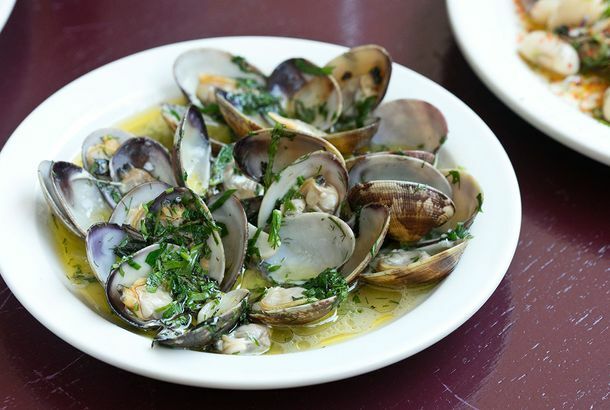 The Hart’s Team Is Opening a Seafood-Heavy Portuguese Spot on the LESCervo’s menu includes raw oysters, preserved seafood, vegetables flavored with anchovies or bottarga, and whole fish cooked on the plancha. There’s a Brand-New All-Hummus Destination, and It Looks FantasticChef Mike Solomonov makes what is arguably the most delicious hummus in America. The Grain Cafe Moves Healthy Mediterranean In Mid-CityBaked falafel and a hummus-of-the-day are central components of this lower calorie Middle Eastern restaurant. Beverly Chicken Takes a Shot at Zankou, Now Open at Wilshire CenterThe specialty here is chicken a la brasa, with hummus, kabob, and shawarma also available. Hummus Bar Express Now Open on Third Street PromenadeSo far, the offshoot of Tarzana’s acclaimed Israeli restaurant is being labeled one of the best quick options in the neighborhood. Farid Zadi Planning Big ThingsThe chef is scheming to break a Guinness World Record. What to Eat at Urban Garden, Now Serving Homemade Mediterranean on FairfaxMight this new George Abou-Daoud enterprise be the Mediterranean cousin to Bibigo or California Monster Salads? Kabab Grill Opens in Palms With House-Baked Bread and Open-Fire GrillingAlready, the daily baked baklava and Arabic coffee are calling to us. L.A.’s Smoking Ban Begins Today; Cardboard Food Packages ToxicStarting today, that after-dinner smoke will have to wait until you get ten feet away from the restaurant. You Gotta Keep ‘Em Separated: Kebab and Pasta Share Space at Cafe SorrentoCould doner panini and kebab cacciatore be in our future? Tandoori Skewers and Medi-Indian Fusion Planned at Culver City’s Kebab BistroSignature’s Cafe owner Azad Virani plans house-baked naan and skewers of beef, chicken, lamb, and fish. First Look at PA2GH, Now Open in West L.A.Ramin Nouri was a veteran of the neighborhood’s Persian restaurant scene, before opening his own place for salmon kebab and veal stew with split peas. Almaza Improves Its Looks With Front PatioThe Mediterranean restaurant has also applied for a beer and wine license. Atlantic Bar & Grill Opening on CahuengaJames Beard-nominated chef Gary Robins is preparing Mediterranean food and steakhouse fare in Hollywood. Panini Cafe Expanding to Americana at BrandThis will be the chain’s seventh location for Mediterranean and Middle Eastern food. Pizza Fries Hit Burbank; Kalbi Burger Opens in KTownNew comfort tastes hit L.A.
Pico and Robertson Will Soon Be Rocking the RasbahKosher Row is gaining a new Middle Eastern/Mediterranean restaurant. First Look at Cuvee’s Remodeled Space and MenuCuvee hopes to reopen with a new look next Tuesday. What to Eat at Momed, Now Open in Beverly HillsExec chef Matt Carpenter helps update the cuisine of the Eastern Mediterranean. Mezza Mediterranean Coming Soon to Culver CityMiddle Eastern and Mediterranean will get a healthy focus in Culver City. What to Eat From Whist’s New Menu, by Chef Tony DiSalvoWhist’s menu goes Mediterranean with Tony DiSalvo’s help. Hummus Place Opens in Morningside Heights, Hoomoos Asli Reopens in NolitaThe latest in the world of hummus. Zipi Zape Reopens As Ameri-terranean Spot, BarberryChef Diego Gonzales will revive old favorites from Alioli.